This condition most commonly results from normal wear and tear associated with aging. The degeneration process usually begins with the discs. As the body gets older, the spinal discs begin to dry out, lose their elasticity and collapse. 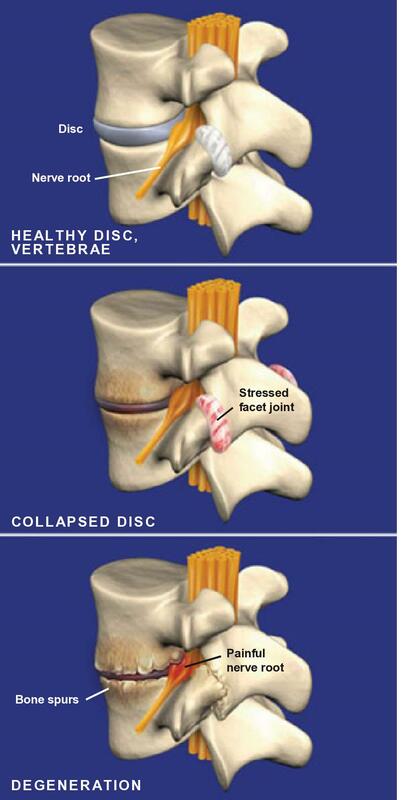 The thinning of the discs places stress on the facet joints and the ligaments that hold the vertebrae together. These structures weaken, allowing the vertebrae to become overly mobile. The vertebrae may begin to shift out of proper alignment and rub against each other. Bony growths called bone spurs may form on the irritated vertebrae. The vertebral shifting and the excess bone growth can reduce the space through which the nerve roots travel, and the nerve roots or the spinal cord can become painfully compressed. Degeneration in the cervical spine may cause neck, shoulder and arm pain. It may also result in loss of fine motor skills, weakness, numbness and tingling in the arms and legs. Degeneration in the thoracic spine may cause pain in the chest and upper abdomen. It may also result in weakness, numbness and tingling in the legs. Degeneration in the lumbar spine may cause pain in the back, buttocks, or legs, with possible numbness, and muscle weakness that may be worsened by activities such as lifting, bending, twisting, or sitting. Treatment options include anti-inflammatory medications, physical therapy, rest, lumbar supports and spinal injections. In severe cases, surgery may be needed. © 2010 Swarm Interactive, Inc.